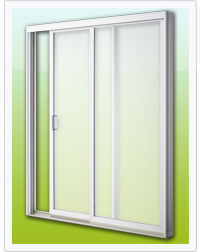 At Visage Windows and Doors we are proud to offer a big variety of Premium Quality Sliding Patio Doors. There are many standard sizes available: 5', 6' and 8' two panel models as well as 10', 12' and 16' four panel units. We can also take care of any custom sized Sliding Doors. Visage Windows and Doors also offers custom transoms and additional side-lite units to satisfy any design requirement. Our high quality all uPVC doors are designed to expand your entry options and allow you to invite the outdoors into your home. The Patio Doors are available with numerous glass options, maximizing your energy performance and adding to the overall energy performance and security of your home. Our Premium Patio Door Collection is available with several hardware options that will add to both the appearance, security and the operation of your door. Choose from our standard twin point decorative handle, available in four weather resistant finishes.